Many caravan parks are situated close to rivers or lakes taking advantage of the natural beauty and attraction of the location. Unfortunately some locations are in areas susceptible to flooding. Marche Industries have developed a system approved by most major caravan/holiday home insurance companies to minimise the risk of damage or loss from flooding to a caravan, lodge or holiday home. Our cantilever system allows units to float up in a controlled arc to 12ft high from their original position and then as water levels recede, to lower back down in a controlled manner. 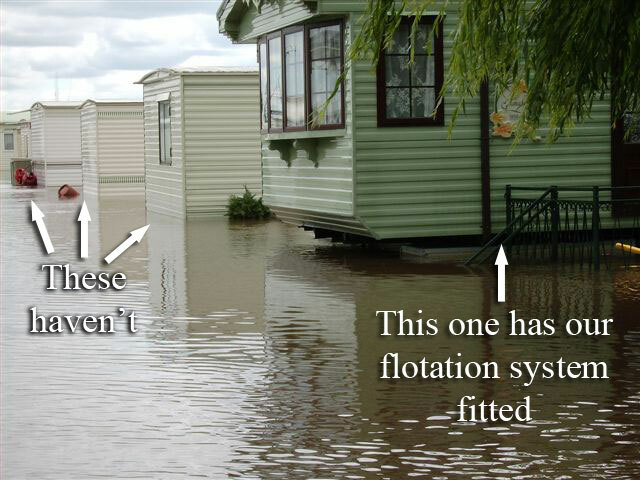 The system uses a galvanised steel framework combined with steel clad polystyrene floats to provide flotation to float the caravan in times of flood. The system has an extremely high success rate and has safeguarded many customers from the heartache and headache of dealing with a total loss due to flooding and has also saved the insurance companies millions of pounds in claims. Follow this link to a BBC News clip below showing our flotation devices in action, or click HERE to see an overview video of our Flotation system.